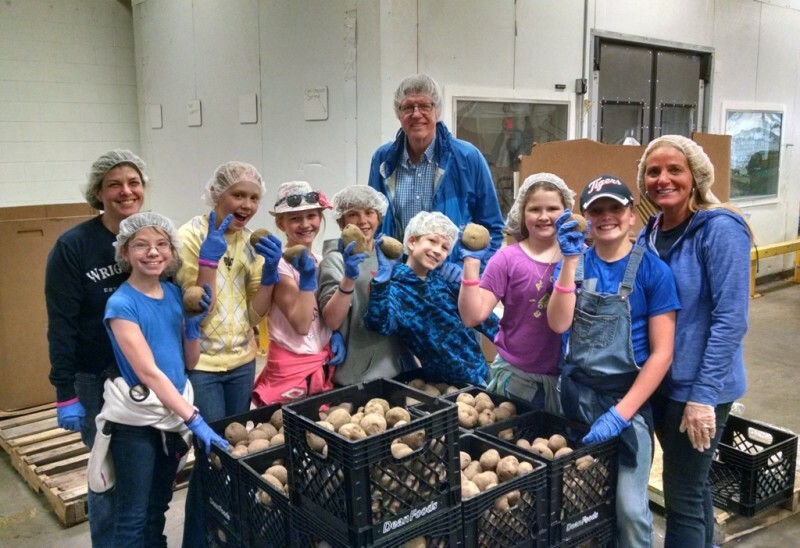 Each year 3-4,000 volunteers serve at Feeding America West Michigan. For much of the past decade, that number has included about 100 fifth graders from Immaculate Conception Elementary School, part of the Grand Traverse Area Catholic School system. On Friday, a fresh batch of fifth graders made the 130-mile drive from Traverse City to Comstock Park. “What are we here to do?” teacher Ben Beckwith asks them when they arrive. Immaculate Conception works with Feeding America West Michigan because, as Beckwith says, no other hunger-relief organization can accommodate so many volunteers at one time, or allow them to have such a big impact. Based in Comstock Park, Feeding America West Michigan provides 22 million meals to food pantries, soup kitchens and community centers across 40 Michigan counties, including Grand Traverse. 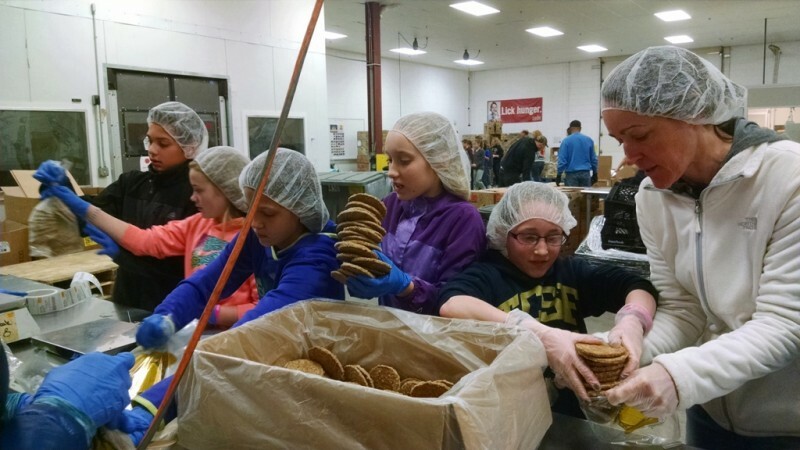 Once equipped with hairnets, gloves and a little knowledge about Michigan’s hunger-relief network, the students get to work sorting potatoes, bagging frozen meat and making “picnic boxes” of assorted condiments in the warehouse. Student Maddie Lessard takes a break from weighing frozen sausage patties to explain that volunteering is a big part of the curriculum at Immaculate Conception. Last month, her class spent time with the residents of a Traverse City nursing home. “We helped celebrate birthdays with them in the month of March,” she says. Classmate Nathan Huffman says volunteer projects are a way to practice the Corporal Works of Mercy central to the Catholic faith — in this case, feeding the hungry. “Basically, it’s doing lots of things for the community that help everyone,” he says. In two hours, the students had packed 8,185 pounds of food. Combined with a $1,000 donation from the school, the fifth graders of Immaculate Conception Elementary helped provide nearly 11,000 meals to people in need. But they aren’t just volunteering on principal this year. The project is personal. 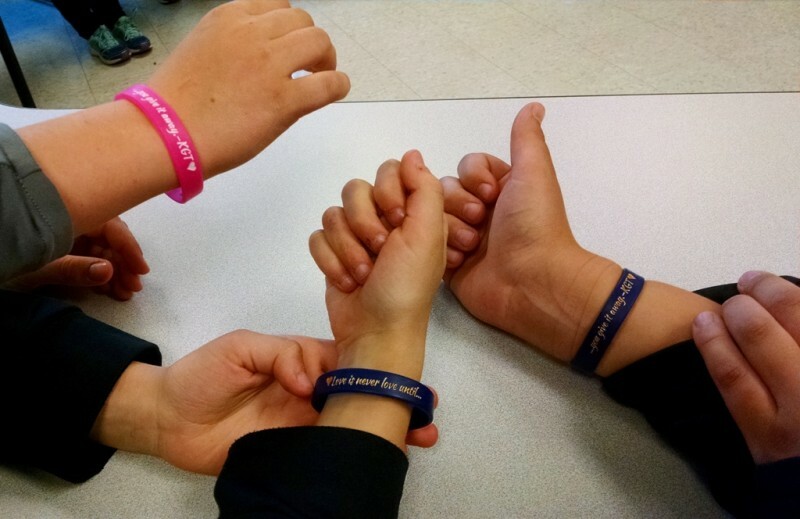 Nearly every student is wearing a wristband bearing the words “Love isn’t love until you give it away — KGT.” The bands honor Keegan Tarrant, the older sister of two of the fifth graders, who died last year. Those interested in serving at Feeding America West Michigan can sign up at FeedWM.org.